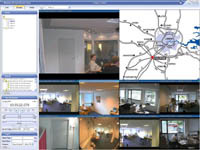 The Milestone Xprotect family of products provides control for up to 64 cameras simultaneously on one screen. Milestone XProtect Remote Client offers a flexible, client/server based, remote access to an XProtect Enterprise or XProtect Professional surveillance installation, and can be run from the server without prior installation, for unlimited numbers of users. 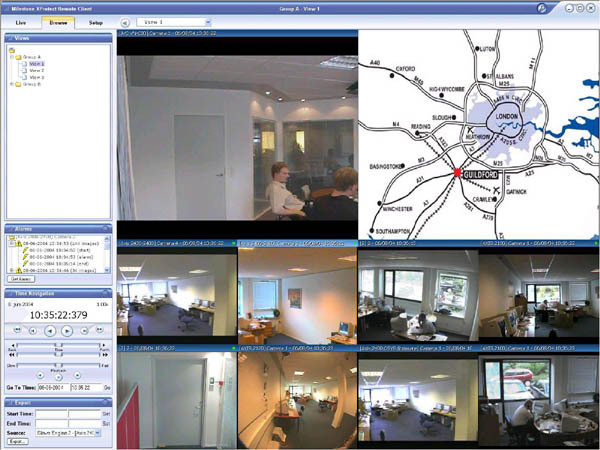 The XProtect Remote Client offerings provides remote access to live and recorded images from up to 16 cameras at a time. Enjoy seamless browsing of current and archived image databases - remotely, at any time.Export AVI or JPG image files for easy evidence sharing with others. Respond to security incidences faster, round-the-clock, no matter where you are! [Find out more...] Milestone Xprotect "Remote Client & Smart Client Factsheet", 1,090kB pdf file.